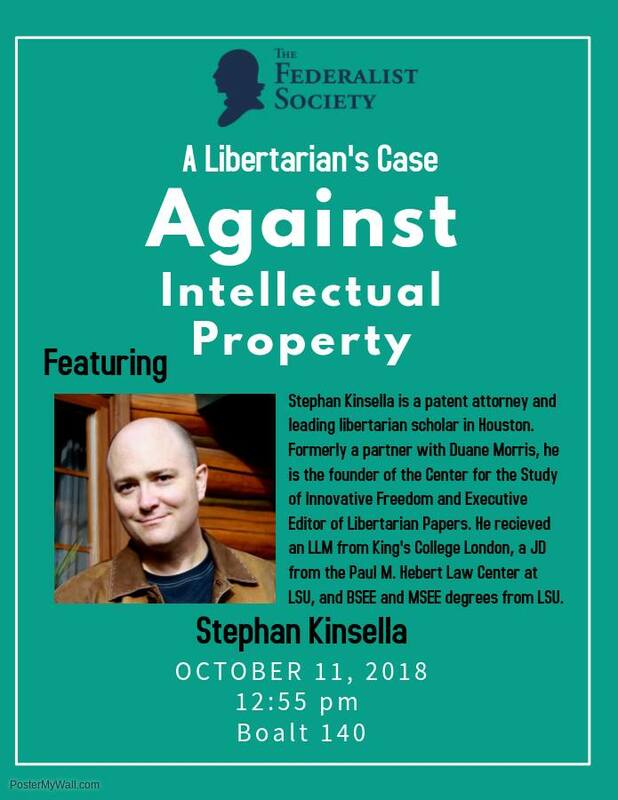 Kinsella on Liberty Podcast, Episode 253. I spoke today on “A Libertarian’s Case Against Intellectual Property,” at the Federalist Society, University of Berkeley-California. It was well-organized and there was a perceptive and interesting critical commentary by Professor Talha Syed. This is the audio I recorded on my iPhone; video below; line-mic’d audio here. My speaking notes pasted below. The question is not “Is IP a good idea?” or “What kind of IP protection should we have?” but rather What type of laws should we have; what laws are just, or justified? History: patents used to grant monopolies. Statute of Monopoly 1623. Originally seen as exceptions to natural law and property rights, as privileges granted by the state to encourage innovation or artistic creation. François Lévêque and Yann Ménière (French economists, 2004): an economic analysis of the cost and benefits of intellectual property “is no more within our reach today than it was in Machlup’s day” [1950s]. economists Michele Boldrin and David Levine: “The case against patents can be summarized briefly: there is no empirical evidence that they serve to increase innovation and productivity, unless the latter is identified with the number of patents awarded—which, as evidence shows, has no correlation with measured productivity. Human action is the employment of scarce means (material resources), guided by knowledge, to achieve some future end goal that would not otherwise occur. successful human action requires access to and control of scarce means, and knowledge about cause and effect. To have conflict-free, cooperative human action, in society, property rights are assigned to the scarce means. Makes no sense to do this for knowledge. Knowledge is non-rivalrous. It still scares me that professors (eg. Talha) who’s primary raison d’etre is in this field of property rights and legal theory, have never in their entire careers bothered to do a simple google search on opposing views. I completely agree with Talha that talking about “natural rights” is dishonest, at least in some circumstances. Rights absolutely are social relations/constructs between people and are essentially claims to things. What I don’t understand is how he then can go on from there to dismiss the idea that all rights are property rights. All claims of rights are claims to something that exists in the world, something tangible. Like I have the right to this land or the right to do something with my body or with a particular resource. That was most confusing, because while I agree with him, Kinsella addressed this issue rather thoroughly. 1) “Natural Rights” is memetic; we know the body of work the term refers to. 2) The purpose of such social constructs is to deal with conflict when it arises; it is a justification for law and property entirely, but it makes no sense with “Intellectual Property”. I think Randy BArnett makes a similar point in his book on the Ninth Amendment. Something to the effect of: it doesn’t matter, for purposes of constitutional construction, whether there really “are” natural rights. what matters is whether this was understood by the Framers at the time and by the populace–and whether this understanding informed the way the 9th amendment was to be understood. If the predominant view at the time was that there are natural rights, then this informs how you construe the 9th amendment and governmental powers, even if you personaly don’t agree with natural rights arguments. How would believing in natural rights affect how you think of the 9th amendment? Also, on a more fundamental level, it kinda does matter that the foundations of one’s legal system are rational. For example, if slavery was thought to be natural or acceptable and enshrined in a constitution, then obviously over time that constitution would change as people become more rational and informed (of Argumentation Ethics, etc). I guess you meant that legally speaking it doesn’t matter ‘cuz “those were the agreed upon rules, for better or worse”, but pracitally speaking it matters. Irrational laws are unstable and prone to revision. Appeal to “natural laws” is absurd and unstable. Since he’s just talking about arbitrary social relations, he can include intangible ideas in those agreements. The universe doesn’t require that our social relationships and contracts be rational and coherent. Basically Kinsella/we are arguing for logical/sane relationships, and he still kinda prefers self-contradicting ever-changing more-flexible ones. We should each be allowed to live our own ways – but we cannot live together.